Time-warp back to the 80s - thanks to FPGA technology! I own several "good old" Arcade boards and want to port them to a modern FPGA system. Luckily, there is quite some information around, including schematics. So far, so good. Nevertheless these boards sometime use some special ICs, which need to be reverse engineered - and somtimes the schematics are incorrect. A lot of this work was and is done by the MAME project, really smart and great people developing a PC-based soft-emulator for such boards. For rebuilding in a FPGA, a little bit more work is to do - expecially if the goal is to rebuild the board "as close as possible to reality". Some parts are also not yet done already, so there are plenty items to work on. I am using more then one FPGA platform, due to practical reasons but also to provide the implementations on a broader base. This is my arcade replay board, the ideal platform for FPGA game development. It uses a Spartan 3E FPGA. The new development platform is not yet released by Mike, the developer of the board, but yet I got games working on his old framework, though. This is the Nexys2 board I own, I can recommend this for FPGA enthusiasts and newcomers because of its "completeness". It uses a Spartan 3E FPGA and I use it to initially debug implementations before continuing on the replay board. The Nexys 3 is ideal if you want a platform with more modern (but also more complex) interfaces, like USB, and with a Spartan 6 FPGA. This is also quite a common board and easy to use, so worth to support as well. This is my "FDIL" board using a Spartan 3E. I use it as test setup for partial implementations and in-board experiments (used within existing boards for tests and data aquisition). A second version is available, see below! Together with Mike from FPGAARCADE.COM I set up the "ultimate" 15k to 100k gates FPGA-DIL board. Due to the used Spartan 2 it will provide 5V TTL compatibility without pull-up/levelshifters circuits, so it allows physical "push/pull" outputs and can replace processors and custom ICs up to 42 pin. I have other boards as well - like Trenz industrial modules and older Xilinx development boards. But as they are not very common to be used for private use, so I usually do not release anything for them. So here they are. I hope by that I can give back a little bit of the work the others already did to make arcade on a FPGA happen! 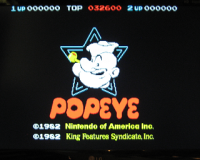 This project is dedicated to re-build the Popeye (© Nintendo) arcade PCB on a FPGA. 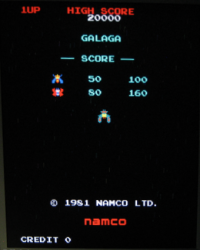 This project is dedicated to re-build the Galaga (© Namco/Midway) arcade PCB on a FPGA. This project is dedicated to re-build the Phoenix (© Centuri/G.G.I.) 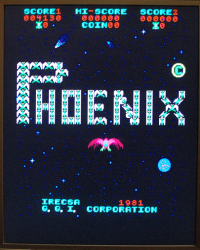 arcade PCB on a FPGA. I have got several more boards I am interested to port.